We trade with commercial antenna companies in good faith we are getting a well vetted product. That some makers seem to deviate from antenna design fundamentals is cause for great concern and an invitation for scrutiny. 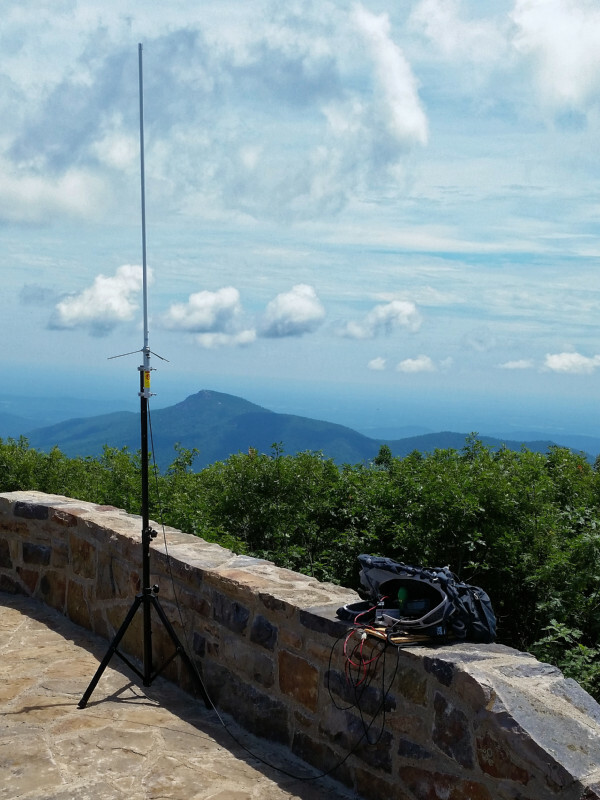 Commercial antenna vendors – misplaced faith? Despite the blight of gainflation on a few too many antenna products in the amateur radio world, the technical scorecard of commercial antenna manufacturers is pretty decent. However, of late a disturbing trend concerning, of all things, decoupling radials is emerging in some antenna products. Some vendors, understanding the problem radials solve, are adding a second set of radials (or equivalent) 1/4 wavelength beneath the first to further improve decoupling of the antenna from the feedline and mounting structure. Others are in a bit of retrograde motion by reducing radial length to well below the fundamental 1/4 wavelength. Is there a revolutionary 21st century evolutionary leap in antenna design we missed? 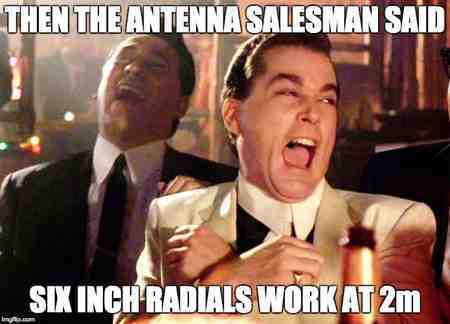 Here’s something to keep in mind when shopping for a 2m/440 dual-band antenna. Pay close attention to the length of the decoupling radials in the antenna. There seems to be a trend to include radials cut for 1/4 wave at 440, rather than 1/4 wave at 2m. Some products exist with radials of 1/12 wavelength @ 2m. These shorty radials are simply pointless at 2m. Two examples are the Diamond Antenna X50 and Comet GP-3. For the Diamond, I’ve seen two X50 models: on older version loaned by a friend and a 2016 version I picked up from the candy store last year. Here is a photo from the 2014 review of the earlier X50 antenna (click to enlarge). In the photo notice the decoupling radials are nice long 19-20 inch radials just right to resonate 1/4 wave at 2m and on the 3rd harmonic for 440 use. The radials perform their decoupling role at both bands and help tame both feedline and mounting structure currents. Lucky us that the 440 FM segment is close to the 3rd harmonic of 2m. Same antenna make, same antenna model, but now shipped with six inch radials only functional at 440. Indeed a simple hand test with a VNA reveals this antenna lights up the coax with rf current at 2m. I aggressively tested my antenna in the hope I was missing some new feature that would allay my concerns. However, only when I add length to the radials are these 2m extraneous currents tamed. The stock shorty radials work very well at 440, but are basically invisible at 2m. 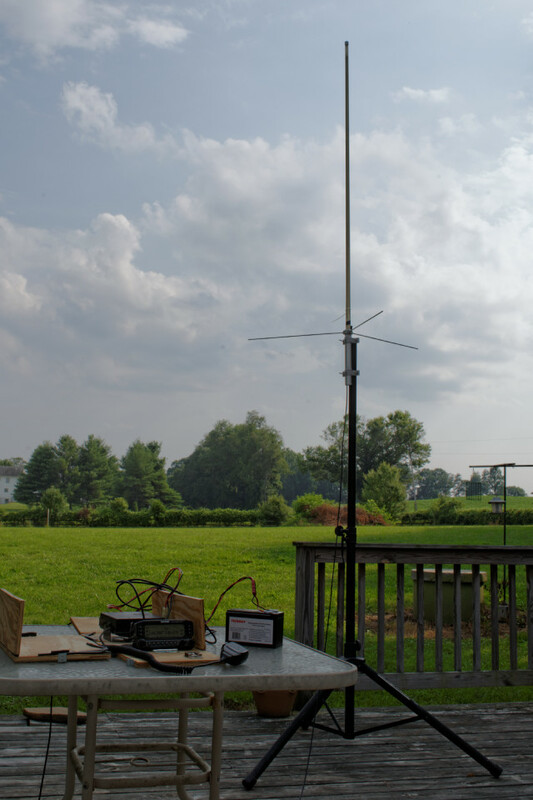 A radio club mate reports his GP-3 also has ~6 inch radials making his installation a bit of a hit or miss affair on 2m given his feedline is likely radiating skyward. Long feedlines aggravate the issue. This is becoming obvious as everyone prepares for our local QSO Party with tall 2m antennas. There was a moment when he could barely hit the repeater with the antenna turned one way, but got in well when turned another. This isn’t exactly what one expects from an omni-directional antenna. As an experiment, he added length to his radials to stabilize his antenna at 2m. Early reports are positive, but more testing is on the way. What are the manufacturers up to? The sad fact of the matter is commercial manufacturers are drifting away from rock solid antenna engineering and making stuff they think we want… whether it works optimally or not. Apparently short radials are now in vogue… antenna performance be damned. I’m a bit flummoxed by it all and am not the only one who has noticed. Is there an explanation? Diamond makes a shorter X-30 model. The description reveals the 2m active element as 1/2 wavelength. This is an end fed half-wave antenna. Hence there is a high impedance feed with some form of transformer and correspondingly small currents on the radial grounding side depending on the topology of the transformer. This is one case where low impedance radials may have little benefit, but then again the mounting structure and/or feedline would be at peak current 1/4 wave beneath the antenna feed point. My experience with half-wave mobile antennas is radials help tremendously on the low impedance side of the transformer. The X50 and Comet GP-3 tout lower impedance element lengths suggesting 2m radials offer a benefit. Analysis of other Diamond Antenna products reveal very clever matching techniques for various antenna models. In the case of the X50, they ship 440 radials suggesting the feed system at 440 is low impedance. Could it be their design now incorporates a different whip/matching combination at 2m involving lower currents reducing need for 2m radials? The VNA hand test, discussed above, confirms RF currents are minimized only with 20 inch radials. From all appearances, it seems the Diamond X50 fell victim to a cost saving measure. We deserve products that work and these 1/12 wave radials on a 2m antenna are demonstrably not cutting it on the X50 and likely on other models as well. The quality of my MFJ apartment antenna is not high. The coax connector that goes to a tuner or transceiver is not the best quality. The wire that connects the whip to the coil has a flimsy alligator clip. A strong wind, ice or snow could detach it. This is not OK because the correct adjustment for a low SWR is difficult. I complained and the MFJ customer service guy sent me another type of clip. My antenna guru told me that if I put it on the coil, I would never be able to move it. To be fair to MFJ, the antenna works remarkably well when propagation is good. My apartment balcony is 22'3". Consequently, I cannot use a dipole or other large antenna for 40m. Years ago MFJ made a SW pretuner with a switchable coil and a proper air dielectric variable cap. They have since replaced it with a cheapy with plastic dielectric. As I often state: "I don't know what the question is, but the answer is money!" Sounds like there might be room in the market now for a no-compromise antenna maker, if we don't have several already. I have a new 12/2016 X50 I am very disappointed in. Too bad I didn't find this website before I spent my money on trust…. The good news is Diamond sells the longer 20 inch radials that should fit and replace the X50 shorty radials. As far as I an tell the design of the vertical portion of the antenna is fine so there likely is hope. I just bought a new 2017 Diamond X50 before reading this, and it has the short radials. Do you know where the longer radials can be purchased? I believe Diamond has spare parts including radials. I imagine the ones used for the CP22E may fit the X50. Don't feel you cannot use your X50 on 2m as is… it will always work a little, but won't function its best in many mounting circumstances. I purchased a nice used X200, with full size radials. I removed the "Runt Radials" and installed the full length radials from the X200 on the X50 and the match dropped to 1:1 – 1:2 at 146 MHz proving (to me) beyond any doubt the short radials affected the match on this antenna. I should also note that after I installed the X-200 back at the same original height as the X50 was previous, my overall performance was NOT that different, I did get a small improvement on 2M, but at 460 I don't think the X200 performed as well as the X50 did, keep in mind this is my own anecdotal evidence. So, in my opinion, if you are primarily operating on 460, the X50 worked well with the "Runt Radials" but if you don't want to run a high SWR on 2M, the X50 may not be the best choice. Thanks for your observations Lance. One good additional test to perform, if you still can, is to move your hand along the feedline/mast at least 20 inches or so while monitoring VSWR or return loss with each length of radials. If your hand affects the reading, that's evidence of feedline/mast rf currents. There's always going to be some, but if the hand test affects one scenario more than the other, the results will be good to know. I decided to try your idea, so I ordered two sets – one for the X50 on my telephone pole, and one for the antenna mounted on a 17 foot mast on the side of the house. I'm not climbing a telephone pole in sub zero temps, but I did try the 19 inch radials on the house antenna. Shooting it with a Rig Expert analyzer, I saw no difference in the SWR between the two lengths. None. Perhaps it will be different with the one on the telephone pole. Thanks for willing to perform some testing. The key thing to look for is different sensitivity to feedline/mast handling (the hand test) indicating the presence of feedline or mast currents bearing in mind SWR is not a primary indicator of antenna pattern degradation from these same extraneous currents.